← VUS iz dos? Suggestions For A Reasonable Policy On Reporting Genetic Variants of Unknown Significance. Sean is VP Brand at Idea Couture, a global innovation consultancy, where he leads teams through the design of new products, services, and programs for Fortune 500 brands. Prior to joining Idea Couture Sean held strategy and communications planning roles at some of North America’s top advertising agencies. Full disclosure: my wife, Allison Hazell, is a contributor and one of the co-creators of the DNA Exchange. Prior to the days of the DNA Exchange I would comment to Allie how fascinating I found it that GCs were involved in such innovative health services, and yet the field as a whole felt a bit traditional. Today, however, the community appears more open-minded than ever. From my view, it’s been amazing to observe how much has changed over these past 6 years. Today, genetic testing is more culturally relevant than I can remember. The levels of testing-related coverage across major media is evidence of the growing public interest; to say nothing of the mentions the DNA Exchange has received. The world of genetics is growing at an almost unfathomable pace, and as we know, with that speed comes complexity and risk of misunderstanding. 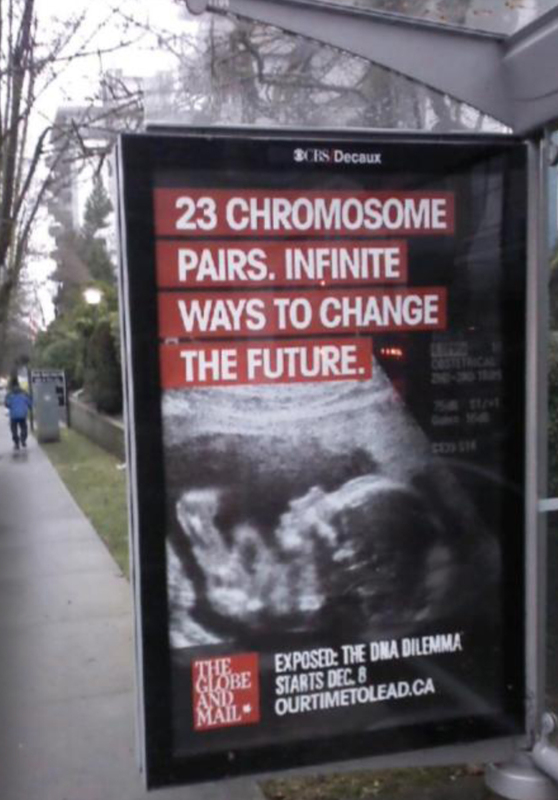 Advertisement supporting the Globe & Mail’s recent “DNA Dilemma” series. As the spouse of a GC I can’t tell you how many times I’ve participated in the dreaded “what do you do?” conversation. Recently, the number of blank stares returned is dwindling. This isn’t to say everyone is fully versed in the role of GCs. Rather, its still surprising how unfamiliar most are with the field. But the levels of public awareness around testing are clearly rising. Of late, “what do you do?” is likely to lead to a dozen follow-up questions for Allie – representing a very wide range of understanding on the subject (if we don’t take it upon ourselves to beeline for the veggies and dip). Which brings me back to the opportunity I see from the sidelines. For all of genetics recent popularity, public understanding is still very low. This gap between interest and understanding will likely only continue to widen, at the rate at which new findings are being reported. Today the GC field has the opportunity – and you might even argue the responsibility – to help to interpret the latest ongoings in genetics for the general public. It’s an opportunity for GCs to repurpose your one-to-one counseling skillset to help to inform public discourse and grow mainstream literacy. The GC community could become Gen Pop’s go-to source for unbiased interpretation on news and notes of human genetics. With a mandate to narrow the gap between professional and public understanding, the field could not only tackle its own awareness issues, but perform a social service that’s increasingly essential. Identify the existing cultural conversations where a GC’s perspective can add value. It’s a lot easier to earn attention through existing conversations rather than finding followers for entirely new ones. Connect with people and parties who are driving related dialogue. Find ways to collaborate with peripheral parties, even if your perspective differs. Responding through an official statement is far less compelling than having a constructive conversation. Develop awareness initiatives that help to demonstrate what you do, versus those that simply state what you do. Good comedians don’t tell you they are funny. Find creative ways to show the general public how valuable your role is today. I realize the notion of inserting GCs into the public arena is not a new idea (most recently, see #3 in Bob’s future post). But the timing feels right to make a push. Whereas many GC awareness initiatives I’ve followed have focused on physicians, the bigger opportunity could lie in aiming straight for the mainstream. An age of health information overload is emerging. As direct-to-consumer services increase awareness, there’s a corresponding need for a direct-to-consumer approach to increasing genetic understanding. And from where I’m standing, there seems no group better suited to guide that conversation. Thanks for having me. I’d love to hear your thoughts, responses, or related experiences. 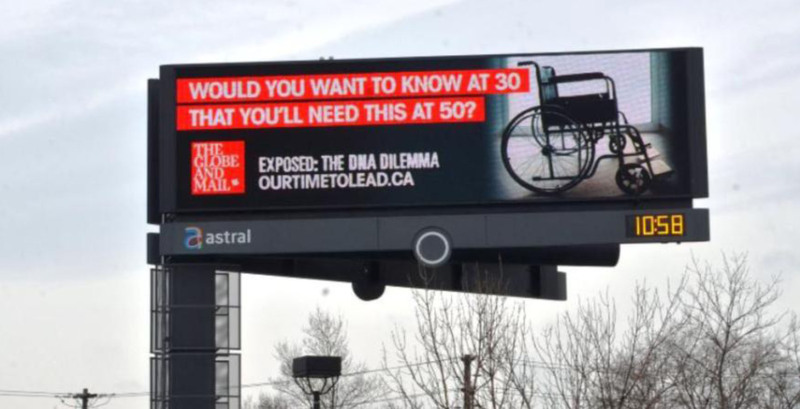 Advertisement supporting the Globe & Mail’s recent “DNA Dilemma” series. Read the full series here (scroll down to ‘Genome’).